Please join us for Tea Time in the Garden in celebration of Wing Haven’s gardens history and the special people who created them. Sunday, May 19, from four to six p.m.
Don’t miss this year’s Tea Time in the Garden, a special multi-generational high tea held in the Wing Haven Garden & Bird Sanctuary. 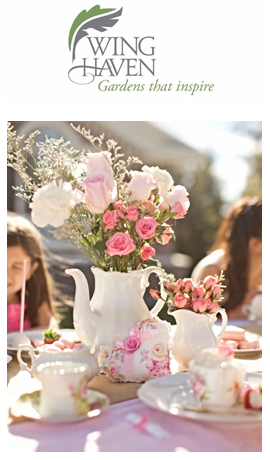 Enjoy traditional tea fare and pink lemonade as well as activities for children including a maypole. This is the perfect occasion to enjoy the Clarksons’ garden, learn more about our gardens’ creators, and celebrate spring in style.